Scott Coker is a promotional genius, and I mean that sincerely. This is a man whom the UFC were willing to keep on their payroll just to keep him from beginning work with another smaller promotion. He's credited with finding and nurturing talent like Luke Rockhold, Jacare Souza, Gilbert Melendez, Ronda Rousey, Miesha Tate and countless others in Strikeforce. But his genius is really more in the P.T. Barnum area of fight promotion. Coker was the man that realized if you put Nick Diaz in with enough B-level guys who will stand and bang with him, a surprisingly high number of people might start to buy him as the best welterweight in the world. It was Coker too who realized that in MMA people care far more about names that they know, than fighters who are actually accomplishing things in the field. Friday's bout between Shamrock and Slice was a freak show from the moment it was signed, but it just got more hilarious week-by-week. From the conference call which Bellator abruptly cut off while Slice was midway through a tirade about how steroids are okay by him (Unfinished Business indeed), to Slice's tasteless references to self harm, to fifty-one-year old Shamrock's jet black sideburns and ring walk with whichever member of the Road Warriors is still alive . But Coker has outdone himself this time. Shamrock and Slice was expected to be garbage-tier, but somehow we're all still talking about it on Monday morning. It's rare when you get the opportunity to ask “Was the fight a fix, or are these two really that bad at mixed martial arts?” Both theories have their merits. I'm not even sure which one I believe yet, but let's examine the idea of fixed MMA bouts. There is a tendency in MMA and boxing to call fix without any consideration for how or why a bout is fixed. Rarely, if ever, is a fight a “work” where both fighters know what is going to happen and pretend to fight in the most convincing manner that they can. If you can't tell the difference between a real struggle and theatrics like pro wrestling, you're probably pretty green in this business. The dynamic is just so different. Take, for instance, the second bout between Minoru Suzuki and Masakazu Funaki—the founders of Pancrase. Funaki and Suzuki's real 'shoot' in a pro wrestling match years earlier had enthralled fans and led to Suzuki and Funaki thinking there was a market for this un-choreographed stuff. If you haven't seen that, and you like grappling (particularly catch wrestling) it is well worth your time. Their second bout in Pancrase, however, seemingly saw them go back the other way. What are the giveaways? Well, Suzuki attempting a theatrical soccer kick in a venue in which they were illegal and throwing himself into the air as he missed was a pretty sure sign of a work. Also Suzuki, an Olympic alternate, going down so easily while attempting wide, theatrical palm strikes is pretty suspect. These guys were top-level professional wrestlers with a ton of catch wrestling experience and the wisdom of teachers such as Karl Gotch and Antonio Inoki. They'd had real fights and wrestling matches. And it was still obvious when they were working together on a performance. A fight which has a set outcome, agreed to by both men—a 'work'—is almost impossible to pull off without it looking fake. Want another example? How about one involving Ken Shamrock, as he's the focus of this article. Shamrock lost to Suzuki once, legitimately. Suzuki caught him in a heel hook, Shamrock attempted to roll out in the wrong direction, and the heel hook forced the tap. Reportedly, after Shamrock was set to fight Royce Gracie for the UFC Super Fight Title the guys at Pancrase decided that it would look bad to have the King of Pancrase lose in the UFC. So, the story goes, that they made arrangements to have Shamrock lose his Pancrase title to a guy who had already legitimately beaten him once before. Now, again, we're working largely on hearsay and "he said, she said" type stuff, but if you can't see the difference in dynamic between these two bouts, I'll be surprised. Bout the first: Shamrock comes out swinging, wrestles Suzuki to the ground, dominates him, but then gets caught in a legitimately horrible submission. Bout the second: the two men come out throwing long, light roundhouse kicks (where both would normally jump in with hard palm strikes). Shammy gets Suzuki on the ground, some loose wrestling occurs, Shamrock goes for an armbar which, even though it was sloppy as hell, it looks like he could have finished. Suzuki escapes and catches Shamrock in a kneebar. There is no weight to the exchanges, it all just feels like a play match rather than the real thing. Similarly in Ken Shamrock's Pancrase bout against a young Matt Hume, the stand up was patty-cakey, the wrestling was free flowing and weightless, and the bout was ended by a Northern Lights suplex straight into a kimura which looked to not be taken anywhere close to hurting Hume. The Northern Lights suplex is just a step too far for me. Works have a horrible tendency of looking fake, but a far more effective means of rigging a fight can be achieved by only approaching one fighter. Only one fighter needs to know that a bout is going to be rigged, after all. That's the guy who is supposed to be losing. This is the grand tradition of “taking a dive”. This has been happening since fist fighting for purses began. Everyone from Archie Moore to Jake Lamotta was asked to lose a fight back before they could dream of being world champions. More often than not it was not the carrot of money which convinced fighters to take dives, but the stick of mob intervention. Famously, Sonny Liston went down on the first decent punch Muhammad Ali landed in their second bout, after taking a beating with a face of stone in their first. Liston had been rumored to have difficulties with the mob for years. When he died of a heroin overdose in 1971, many were rightly suspicious of the fact that the offending needle—nor any other equipment one would need—could not be found, especially as Liston was notoriously terrified of needles. MMA hasn't been without dives, though. Mark Coleman famously threw a fight against Nobuhiko Takada when he was running low on funds. Nobuhiko Takada has to rank among the worst high-profile MMA fighters of all time. He lost every meaningful fight he was in, and the only wins on his record are “pro wrestling exhibitions” held in the PRIDE ring, like his bout with Alexander Otsuka which he won by fisherman suplex but which still appears on his official MMA record on some websites, or bouts against paid off opponents. Mark Coleman took Takada down with ease, as expected. Coleman wasn't known for passing guard, but he still repeatedly passed the guard of Takada with little difficulty, only to place himself back into it specifically to give Takada the heel hook. Takada might have known about the work, but he was also a delusional enough fighter that he could have been convinced he legitimately snatched the heel hook out of nowhere. But you can't just call 'fix' every time a favorite makes a mistake and loses to an underdog. You will remember the talk of fixes when Anderson Silva lost his first bout against Chris Weidman. Hell, Sports Illustrated ran a roundtable on it, despite the fact that seemingly none of the members of the roundtable had actually seen the fight. But equally, in these situations, you are often forced to ask why the promoter would bother asking the fighter to take a dive. Firstly, it rarely looks convincing. And secondly, if the fighter is an underdog anyway there seems little point to it. Bengtsson was a massive underdog against Emelianenko, and he seemed to make a conscious attempt to wrestle before giving up. It could well be a case of an overmatched fighter with no heart to take punishment when he's going to get paid the same if he loses immediately or loses brutally later on. Understanding the difference between a work and a dive, let's examine the abysmal match up between Shamrock and Slice. The first factor which has been discussed is the long, largely strike-free clinch between the two men. Joe Rogan observed that the two men were mouth-to-ear for a long while. Certainly, this is the point of tie ups and rest holds in professional wrestling: to communicate the next exchange or a turn in a bout. We can class this as evidence to the idea of the bout being a work with both men co-operating. The second factor which surprised many was how easily Shamrock got Slice down. It is worth considering that Slice's knees are ruined and he never adapted to the grappling game all that well anyway. In fact, Shamrock might be the best wrestler Slice has ever faced. How sad is that? The third facet which is considered tremendously suspicious is what Shamrock did with back control once he easily took it. He stretched Slice out and proceeded to throw no strikes. He instead looked to camel clutch and get his arm under Kimbo's chin. It seemed at several points as though anyone who wasn't Shamrock would have finished the choke and that Slice was doing little to defend. This is evidence to the idea of a dive—because clearly Slice was floundering, many think that Shamrock let Slice off the hook in order to fall down like he was supposed to later on. Pictured: How not to defend the rear naked choke. It is, again, worth noting that Shamrock hasn't choked anyone from the back since 1994. His submission game was always leg lock centric, and relied on his tremendous strength rather than any technical brilliance. It is also worth remembering that back when Shamrock was learning these techniques, the rear naked choke was a bit more primitive. Sneaking the free hand in between the chest and the back of the opponent's neck wasn't as vital a part of the game as it is today. And certainly, folks who have been around this game a while will have seen the rear naked choke taught with the free hand much higher on the head. Indeed, this is how Shamrock finished Bas Rutten in their first bout. Though here Ken hides the hand sneaking in behind the head beautifully. While we can ultimately never know if Shamrock fought with the intention of losing, or if the two were in on it together but Slice decided to knock Shamrock out properly anyway, we can safely say that this was one of the worst MMA fights of all time. The real question is why would anyone want to rig it? From the moment the match was signed it seemed like Shamrock was intended to lose, and getting Kimbo's back is about the best many of us thought he could have done in this fight. 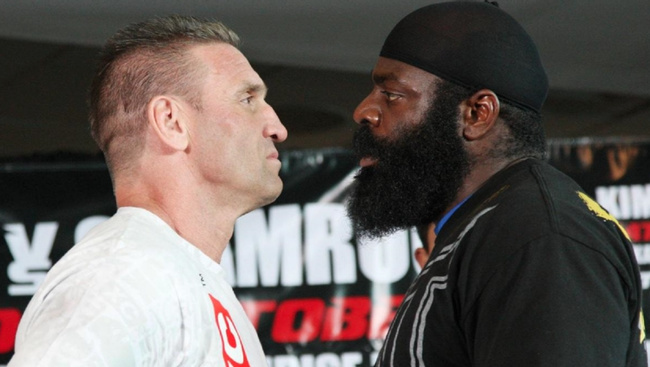 Ken Shamrock doesn't come out looking any better, Kimbo Slice just comes out looking worse. With Scott Coker ready to declare that Kimbo is the biggest star in MMA—and the his previous numbers and Google search figures do suggest he is, as sad as that is—what benefit is there in having your main event attraction barely scrape past Ken Shamrock? Ninety percent of people would rather see famous guys try to fight, than brilliant fighters do their job. If any of the UFC's champions fought on FOX, on the same day as Kimbo Slice fought on Spike, Slice would almost certainly receive more views. You have to respect Scott Coker for being the man is willing to make a laughing stock of his product in the educated fan's eyes just to cater to that.